Friday, February 24th: Last regular WOD is at 3:30 PM. (No 4:30,5:30,or 6:30 regular WODs). “Friday Night Lights” begins at 5pm. Sign up on Zen Planner for your Open WOD time slot from 5pm-7:30pm. 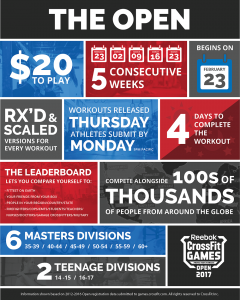 Even if you aren’t doing the Open, you can still workout Friday nights–just sign up! Saturday, February 25th: One WOD at 7:30am. No Yoga, No Open Gym. Sunday, February 26th: Closed due to Gymnastics Seminar. Six-Pack Sunday will resume next week.